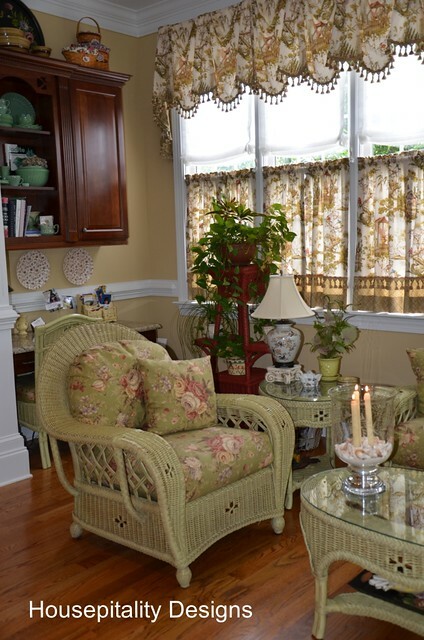 This room was designated the “sunroom” until the house went up next door and then the curtains went up……. However, on the house plans, the breakfast room was originally to be in that space. …..and an island with counter stools…. …..and a bar wrapping around the kitchen with barstools. Did not make sense to add another table…did not want it to look like a cafe or something like that….. 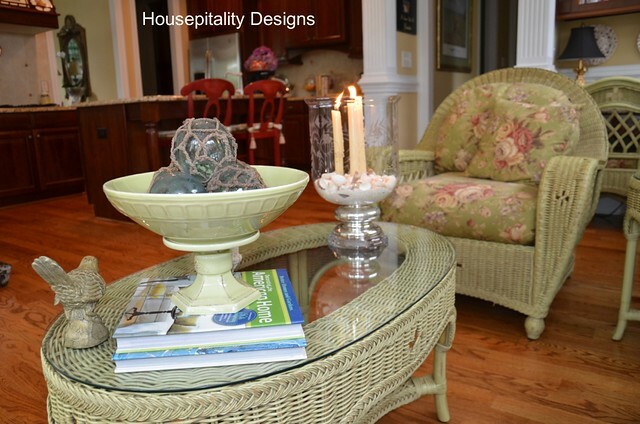 When Amy from Maison Decor saw my home tour over at Debbiedoo’s…. So Amy….”this one’s for you!! !”….and maybe I’ll throw in a “Bud Light” at the end…. 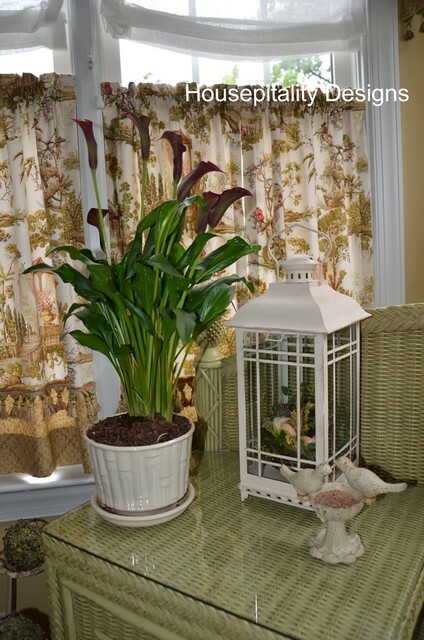 I present the sunroom…or maybe I should rename it the Green Room…..but do not look for celebrities here…. There is an ottoman that goes with this chair, but I chose to place it on the other side of the room…..
….for extra seating….this is a place where we love to gather…. 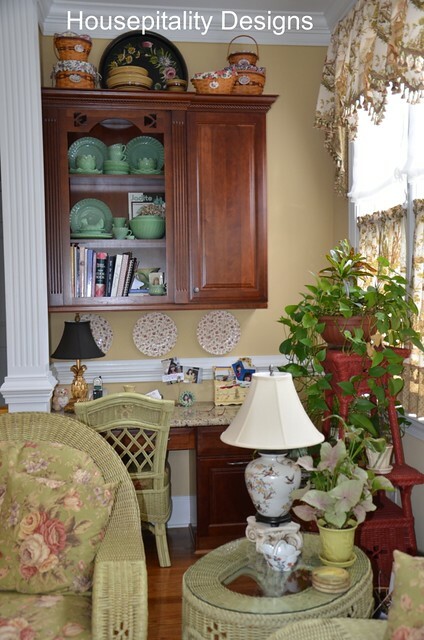 Behind the chair is the desk area…a hutch to display my jadeite and cookbooks…. …..now do I sit there and plan my meals?….or search through my cookbooks for great culinary inspiration…??? ………….makes you think that I am a serious cook….right???? Well, Giada thought so…and wrote so…. ……………….but really does not know so…. :) I pretend with great books! OK Amy…I can hear you now…details, Shirley…I want details…. 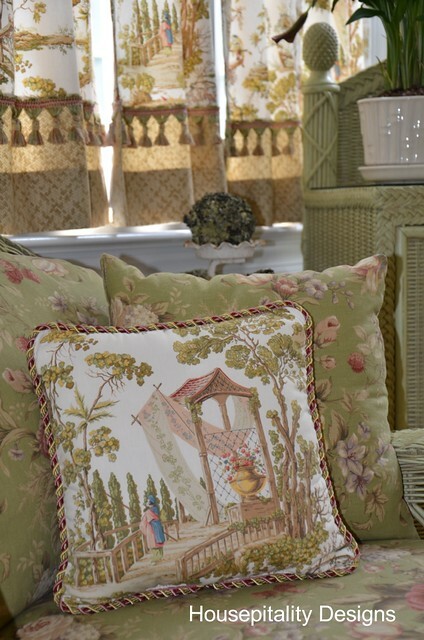 The fabric is “Fantasy Garden — Champagne” purchased from Calico Corners….love that place! The trim was purchased at a great local fabric store…Mill Outlet Village. …..she was recommended by a friend and neighbor…. To break up all the pattern, I decided to add a banding and trim to the bottom portion of the cafe curtains…. …..I purchased the green basket weave pattern fabric from Printer’s Alley in Raleigh….. 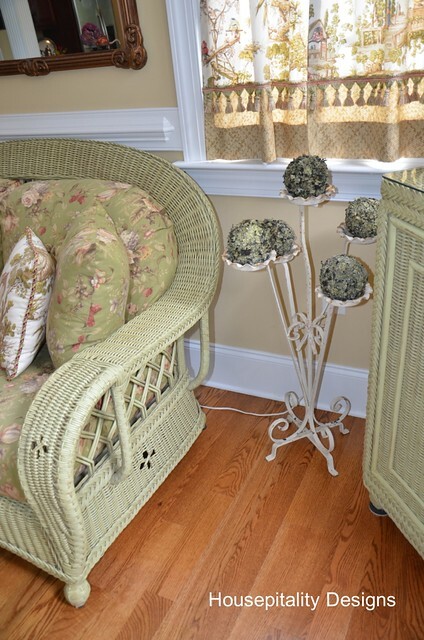 I was not only drawn to the color of the wicker….this planter/cabinet caught my eye….had to have it! …..and not to mention, I loved the finials on the planter cabinet…..yep…very pineapplesque I would say! 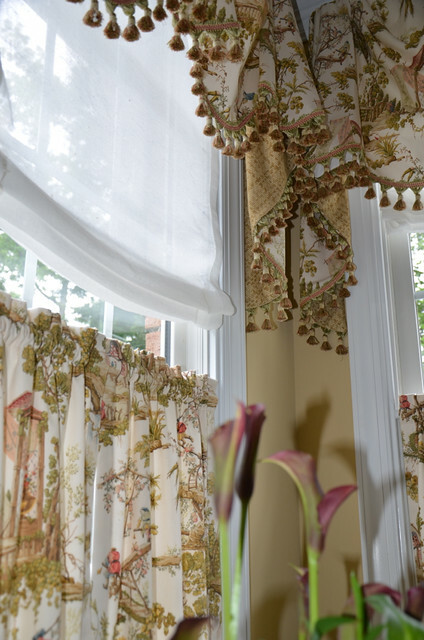 Tole trays are great in a well lighted area…prints seem to fade in the sun…..
…..thus the choice of the kingston valances….. The wicker came in three choices of colors…white, green, and red…. …..it brings out the red in the fabric of the love seat and chair. I think this was last year…!..It is one to see! I LOVE this room. There is nothing I would change, truly, a treat for the eyes. This is such a pretty room. I love that large hurricane. You already know how much I love this room! I so enjoyed getting to tour this beautiful space again! So pretty…and looks relaxing. Thanks so much for sharing more of it. I’ll be right over – keep the Ottoman warm!! You have a beautiful sun room. Every detail is just perfect. If you remember, the first time I visited your beautiful home I told you this was my favorite room. Nothing’s changed…it still is. Love it and I can’t wait to sit there with a glass of wine soon and talk, and talk, and talk to my BFF!! Shirley, This is such a beautiful room! I love the drapes and your fabric choices. Perfection. Shirley I LOVE everything about this gorgeous room!! Thanks for showing it up close, I love posts like that! It’s been a delight visiting your home and getting to know you a little better through the way you live. So gorgeous!! Everything ties together perfectly! I LOVE that big hurricane too. And the plants make the space so homey 🙂 Have a good weekend! I’m so glad Amy asked you that….it was so mice to see more. Its beautiful! Your green room is absolutely gorgeous! Thanks so much for sharing! Oh, my Lord! Your sunporch is the most beautiful porch I’ve ever seen. Love your pretty wicker and the way you’ve arranged everything. 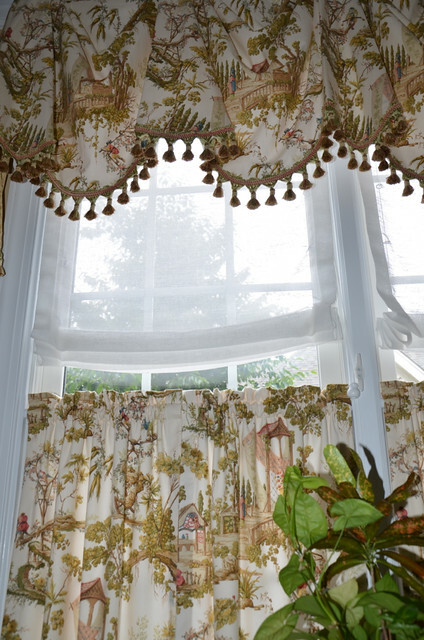 Your curtains are so lovely too and are really very elegant. I would love to sit out there and drink a cup of tea with you. Love your beautiful room. What is that gorgeous wall color? Absolutely beautiful. 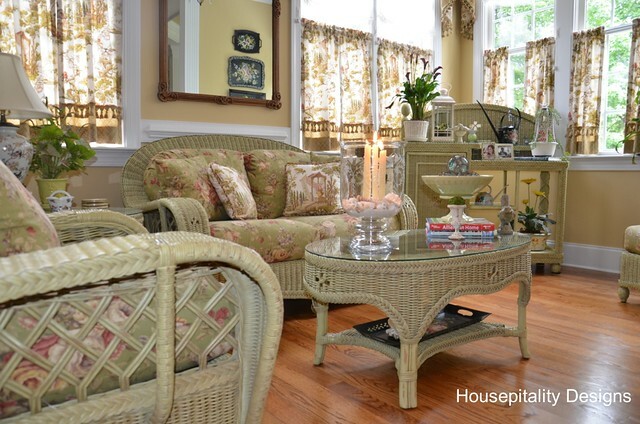 Such a great room, Shirley! You already know I love those window treatments! I think I jumped right on them the first time you showed a picture of your sunroom. Now I’ve got a third option floating around in my head for my sunroom! I’ve got to get some fabric on those windows. What a wonderful room! Sitting there, poring through your cookbooks would be such a delight. Lovely! It’s beautiful, and refreshing. It’s nice to see color and pattern. Oh Thank you Shirley!! I loved seeing it in better detail, its just beautiful! So the funny thing is I had custom romans done in the same fabric from Calico but in the yellow colorway and finished them off in pink and yellow tassels…way back when my dining room was pink and yellow…since I have sold them on my etsy shop. 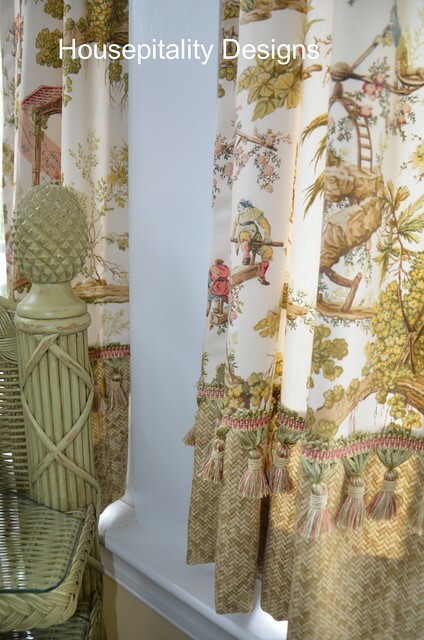 But I do love that asian toile…its very charming! 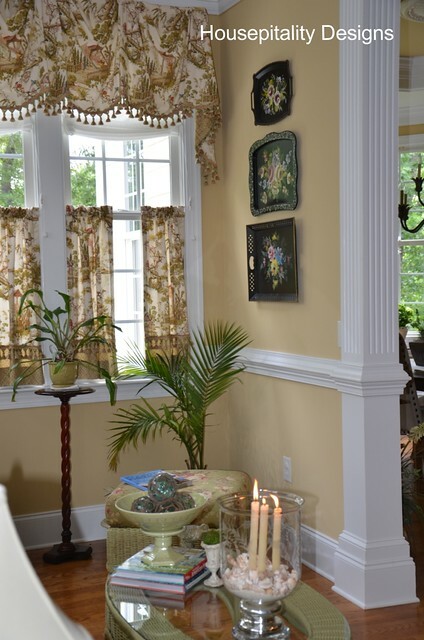 I love the tole trays on the wall, and the way you have accented the room, its all put together so nicely. 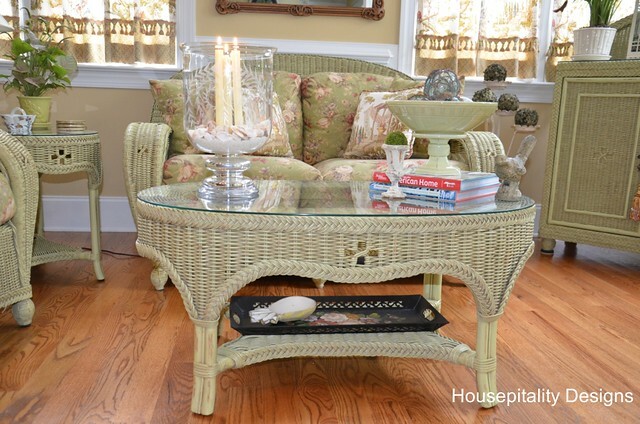 LOVE love love the wicker set!! And I love the formal kingstons done in the happy colors it makes it “friendly formal”~the cafes with the added details are just the perfect complement. Thank you for posting it! This is one of my favorite spaces in all of the world Shirley! Love the warm colors and the windows, and all the pretty patterns you have. Enjoy your day! 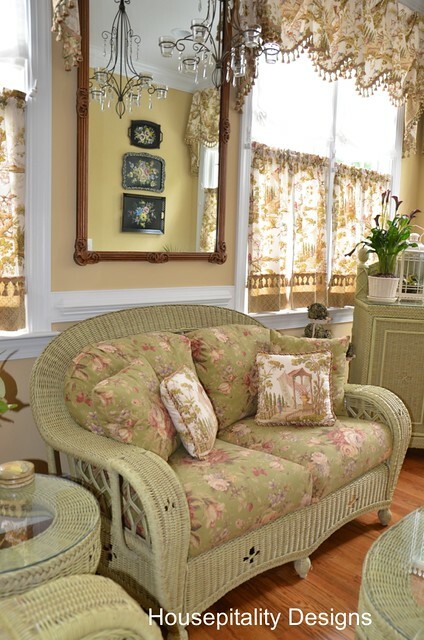 Your sunroom is just beautiful! 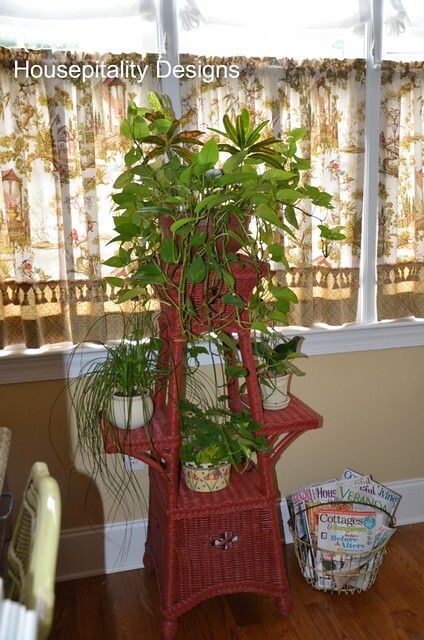 I like how you mixed the red wicker plant stand with the green wicker furniture too. Wow! You had your curtains made by the same person as Kristy Yamaguchi! Very nice! Thanks for the detailed tour. It was my favorite room of your home tour also. I love your sunroom…what a great idea to have a sunroom rather than as a breakfast room..now you have my wheels turning. Thanks for sharing the extended tour at Show & Tell. The red planter really does make the other colors pop! This is beautiful! Thank you for joining me at Home Sweet Home! 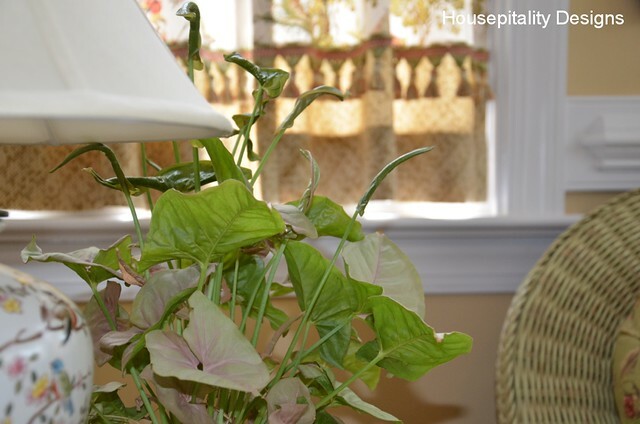 Shirley, your sun room is gorgeous! My hubby and I both love it! Lovely job and what a sweet place to relax. Thanks for opening up your home for us to have a peek. Your sunroom is just perfect. 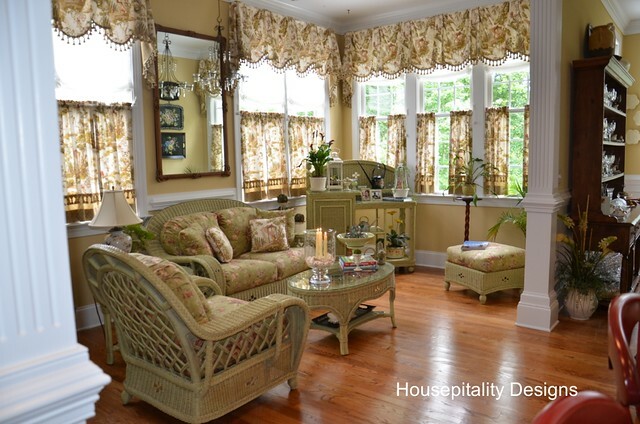 I love the wicker furniture and curtains. Thanks for sharing what could be in a magazine. Love the room and especially how you have so graciously shared your home with us. What a stunning room. I will be featuring it tonight at my Swing into Spring party that opens at 8pm EST tonight. 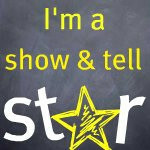 Please stop by and pick up an I’ve Been Featured button. Thanks. Oh goodness such a pretty room! 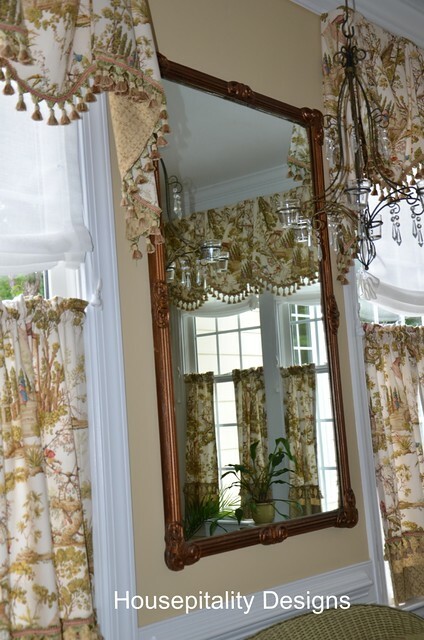 Love all the pretty fabrics and trim! I love tole trays also- you have yours displayed beautifully! 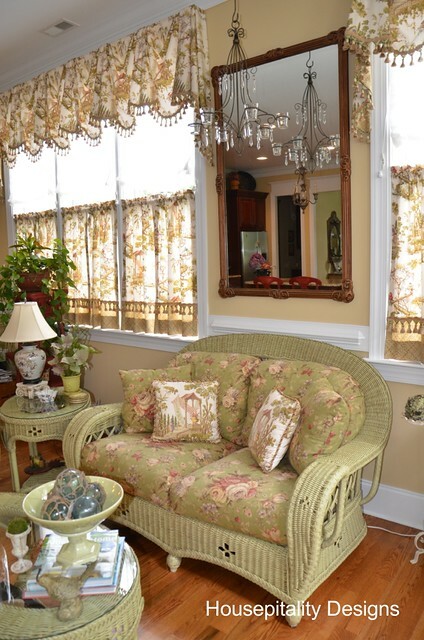 The award for the most beautiful sunroom goes to you. Great job I love the fabric. Love your house and your blog!!!! Just found it today!!! You seem to have used the same wall color through most of the main floor and the master bedroom. What is it?